E-commerce (Electronic Commerce) is a transaction of buying or selling online. Modern electronic commerce typically uses the World Wide Web (Internet) for at least one part of the transaction’s life cycle. 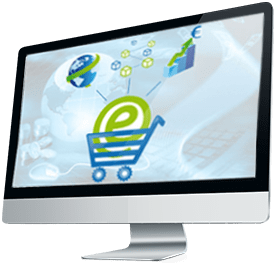 While E-Commerce is generally processing transaction online, E-Commerce web development is the platform to involve your business activities such as listing your products, sell, process payments, process orders and more. In simple it is the way you bring your business online. E-commerce stores in other terms online shopping is an internet business where all transactions take over the internet. In recent days internet selling and buying is quite common and becomes a trend on commerce world. You sell anything; it may be books, cars, electronics, groceries or even your services you will have a solution to sell online. It is fact that an online store can bring you sales more than sales from 500 physical stores but all about how your online store is designed and how your ecommerce web site is indexed with search engines. At Dart Innovations we listen, observe and then design your business for online. Open Source Ecommerce suits are generally meant for free to download, customize, self-host and use it as yours. We work with various open source ecommerce platforms and some of them are listed below. We choose the platform based on your preference unless you have a choice already. Hosted solutions are generally subscription based where the providers charge on monthly/yearly basis. You don’t need to install or setup where the basic store is normally setup upon your subscription. You can straight away start your customization. Custom Ecommerce Development is a tailor made solution that we develop from the scratch based on your needs. In few cases according to your customized business requirement you may not like to go with open source solutions, in those cases our Custom Ecommerce Development service is for you. Our developers are experts in Core PHP, .NET, web frameworks and other web languages hence we can drive your project from the scratch and build a ready to sell online store. We have various modules built ourselves and huge experience on shipping and payments API hence we can able to build your ecommerce store much quickly. At Dart Innovations we listen, observe and then design your business for online. We concentrate much on the usability engineering to bring your site visible and easy usable to users. We just not setup and customize where we make sure the platform is selling good.